The sun emitted a significant solar flare, peaking at 4:01 a.m. EDT on Oct. 25, 2013. Solar flares are powerful bursts of radiation. Harmful radiation from a flare cannot pass through Earth’s atmosphere to physically affect humans on the ground, however — when intense enough — they can disturb the atmosphere in the layer where GPS and communications signals travel. This disrupts the radio signals for as long as the flare is ongoing, anywhere from minutes to hours. This flare is classified as an X1.7 class flare. “X-class” denotes the most intense flares, while the number provides more information about its strength. An X2 is twice as intense as an X1, an X3 is three times as intense, etc. In the past, X-class flares of this intensity have caused degradation or blackouts of radio communications for about an hour. Every year, October is designated as American Archive Month. While many people may think “archive” means only dusty books and letters, there are, in fact, many other types of important archives. This includes the use of archives for major telescopes and observatories like NASA’s Chandra X-ray Observatory. The Chandra Data Archive (CDA) plays a central role in the mission by enabling the astronomical community – as well as the general public – access to data collected by the observatory. The primary role of the CDA is to store and distribute data, which the CDA does with the help of powerful search engines. The CDA is one of the legacies of the Chandra mission that will serve both the scientific community and the public for decades to come. To celebrate and support American Archive Month, we have selected images from a group of eight objects in the CDA to be released to the public for the first time. These images represent the observations of thousands of objects that are permanently available to the world thanks to Chandra’s archive. For people in the eastern United States, the sun will rise half covered by the moon on Sunday morning, November 3, and the partial eclipse will last about 3/4 of an hour. Jay Pasachoff, Field Memorial Professor of Astronomy at Williams College and chair of the International Astronomical Union’s Working Group on Eclipses, advises that people able to see very low on the eastern horizon and having suitable filters in hand would enjoy the event. A total solar eclipse will sweep across Africa about two hours later on that Sunday, when it will be afternoon, six hours later, in west Africa. After starting in the Atlantic, the shadow of the moon will reach Gabon, where Pasachoff and colleagues will observe totality, with the support of a research grant from the Committee for Research and Exploration of the National Geographic Society. Tyson, the narrator of Dark Universe, will discuss what goes into the Space Show with astrophysicist Mordecai-Mark Mac Low, who curated the Space Show; Carter Emmart, who oversees astrovisualization at the Museum and served as the Space Show’s director; Vivian Trakinski, who produced Dark Universe; Timothy Ferris, author of Coming of Age in the Milky Way and other acclaimed books, who wrote the Dark Universe script; and composer Robert Miller, whose previous collaborations with the Museum included the score for the Space Show Journey to the Stars. When a star similar to our Sun is born, it is surrounded by a disk of dust and gas. 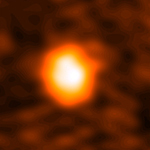 Within that disk, the star’s planetary system begins to form: The dust grains stick together to build larger, solid, kilometer-sized bodies known as planetesimals. Those either survive in the form of asteroids and comets, or clump together further to form solid planets like our Earth, or the cores of giant gas planets. Current models of planet formation predict that, as a star reaches the planetesimal stage, the original gas should quickly be depleted. Some of the gas falls into the star, some is caught up by what will later become giant gas planets like Jupiter, and the rest is dispersed into space, driven by the young star’s intense radiation. After 10 million years or so, all the original gas should be gone. But now a team of astronomers from the Netherlands, Hungary, Germany, and the US has found what appears to be a rare hybrid disk, which contains plenty of original gas, but also dust produced much later in the collision of planetesimals. As such, it qualifies as a link between an early and a late phase of disk evolution: the primordial disk and a later debris phase. NASA’s Great Observatories are teaming up to look deeper into the universe than ever before. With a boost from natural “zoom lenses” found in space, they should be able to uncover galaxies that are as much as 100 times fainter than what the Hubble, Spitzer, and Chandra space telescopes can typically see. This ambitious collaborative program is called The Frontier Fields. Astronomers will spend the next three years peering at six massive clusters of galaxies. Researchers are interested not only as to what’s inside the clusters, but also what’s behind them. 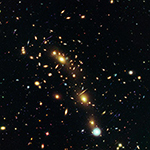 The gravitational fields of the clusters brighten and magnify distant background galaxies that are so faint they would otherwise be unobservable.